Monroe, Virginia sits quietly beside US 29, dozing in the sun as one would after a strenuous task has been completed and put aside for now—or maybe forever. The sleepy suburb is home to several hundred residents who commute to work in the mornings, rejoin their families in the evenings, and occasionally remember a time when their village was a busy, smoky, noisy place where trains arrived and departed every hour on the old Southern Railway. 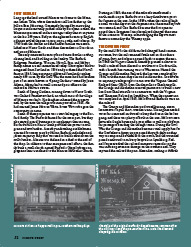 In those days nearly everyone had a connection to the railroad: they worked for the Southern or sold goods to those who did, or they had relatives helping to move trains from Washington southward to Danville and on to Spencer in North Carolina. The railroad set the tone of the community, and time was kept to the tune of blowing whistles and horns announcing the arrival and departure of every train. 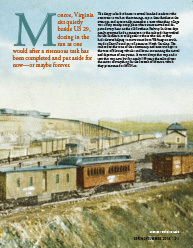 It wasn’t always that way, and it isn’t that way now, but for nearly 100 years the railroad was the center of everything for the citizens of Monroe, which they pronounced as MUN-ro. Thomas G. Ledford was the first administrator of the Lynchburg Museum System. He retired from the city in August 2005, after seeing the 1855 Court House restored to its original splendor. Special thanks to Kathryn Pixley for providing inspiration, information, and photographs.